In this section an overview is given off all the past and future projects FerWay has participated in. This information, combined with the Services overview, will provide a broad insight into what FerWay could contribute to innovating your ATM Organization. XMAN - Extended Arrival Management: support the LVNL organization to develop a Concept of Operation for an XMAN trial between Reims, MUAC, Belgo control and LVNL, in collaboration with To70. The trial is planned for 2019. XMAN - Extended Arrival Management: support the LVNL organization to develop a KPIs for an XMAN trial between Reims, MUAC, Belgo control and LVNL, in collaboration with NLR. The trial is planned for 2019. Sensitivity study for high-resolution weather model in Trajectory Predictor for AMAN Schiphol and iCAS iTEC-based system. In collaboration with KNMI, a high-resolution weather model, augmented with Mode-S derived wind and temperature updates, has been developed. FerWay is conducting a sensitivity study of the optimum resolution for the weather-grid in the ATM-context. 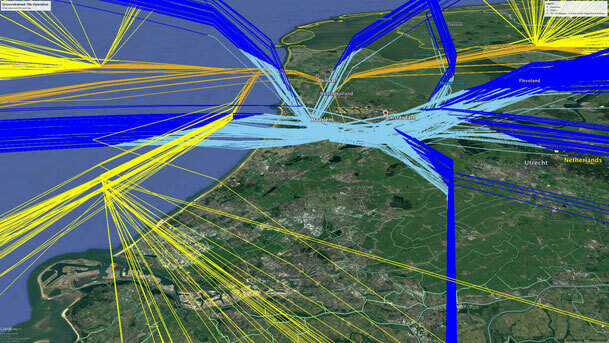 Night Optimal Way to Land (Night-OWL): Operational trial at Schiphol Airport for night time operations using the Tailored Arrivals Development Trajectory Prediction function as a Trajectory Management tool un a fixed Terminal Areas routing environment. The project is executed in collaboration with the Knowledge and Development Centre Schiphol (KDC). Definition of (technical) ATM concept improvements for increased success rate of Tailored Arrival operations at San Francisco international airport for FAA (2009-2010). Cost Benefit Analysis for Speed and Route Advisor (SARA) implementation at Toronto International Airport for NavCanada (2010). Fuel efficiency analysis of an aircraft operating using the FMS RTA capability in metering context (2011-2012). Analysis of downlinked aircraft parameters for NASA Ames (2012). Study for possibilities for use of Aircraft Datalink below FL245 in Amsterdam-FIR, in collaboration with MovingDot (2014). Study into the possibilities of the Inbound Priority Sequencing: Airline Priorities, in collaboration with MovingDot (2015). Study into Business case for expanding the AMAN radar horizon in collaboration with To70 (2016-2017). The study outcome supports the decisions as to how extend the AMAN planning horizon towards support for a full Extended-AMAN operation. One of the key elements in the concept is the use of radar data for Trajectory Prediction. This makes the required radar range play an important role when extending the planning horizon. Development of a vision on the role of an X-environment (eXperimental) for the Schiphol sector to demonstrate new technology in a high fidelity environment and in live operations in collaboration with NLR & MovingDot (2017). The results will be used to launch the implementation of the X-enviroment. Implementation survey for high-resolution weather model in Trajectory Predictor for AMAN Schiphol. In collaboration with KNMI, a high-resolution weather model, augmented with Mode-S derived wind and temperature updates, has been developed. FerWay is conducting a survey of: benefits to be expected for the ATM System at Schiphol and implementation roadmap. Post-OPS evaluation and tuning of Schiphol operational AMAN performance parameters. New tuning to be commissioned in March 2019. Training of operational staff to use the new AMAN system at Schiphol (2018). Approach supervisors were trained in the use of the AMAN System (ASAP) commissioned in November 2018. Validation and tuning of operational performance of the new AMAN System at Schiphol Airport (ASAP) in shadow and trial mode (2017). Requirements Definition of HMI functional system architecture requirements for replacement of ATC The Netherlands Approach and Area Control automation system in collaboration with Deutsche Flugsicherung (DFS). Trajectory Predictor (TP) architecture study for introduction of external AMAN System (2010). Identification of requirements for future AMAN versions compatible with the ATM Strategy (2011). Definition and Development of TP parameter generation environment based on surveillance data (2012). HMI requirements definition for iCAS automation system serving APP & ACC in AMS-FIR (2012). Definition of requirements for TP supporting new AMAN and Speed and Route Advisor (SARA) tool (2012-2013). ATC The Netherlands: Definition of requirements for new Arrival Manager (AMAN or Scheduler) (2012-2013). Validation of TP used in new AMAN System (ASAP) for Amsterdam Schiphol airport (2014). Analysis of Go-Around detection performance tool GARDS, for Schiphol Tower (2014). Validation of ASAP AMAN functionality to be introduced in 2018 at Schiphol airport (2015-2017). Analysis and definition of HMI functional system architecture requirements for replacement of ATC The Netherlands Approach and Area Control automation system (2013-2015). These projects were executed on behalf of ATC The Netherlands, funded by KDC Mainport Schiphol.